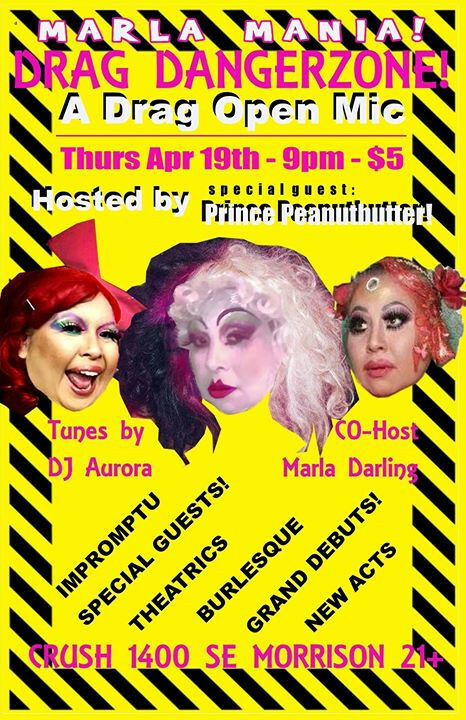 Drag Dangerzone: A Drag Open Mic, Marla Mania! Thurs Apr 19th! Drag Dangerzone: A Drag Open Mic is BACK and it's all about Marla Darling, one of our lovely hosts and birthday girl! Special guest host from The Land of Chunky: Prince Peanutbutter! Watch drag in all forms where you can sign up and be part of the show! Try something new/try a new character/try something different/improv/new acts and MORE! Cast list is full but you can always message Aurora Diane Owen or Carol Gates for more info! And make sure to like us on Facebook!